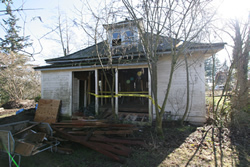 The back kitchen and porch of the house had suffered the most over the years. 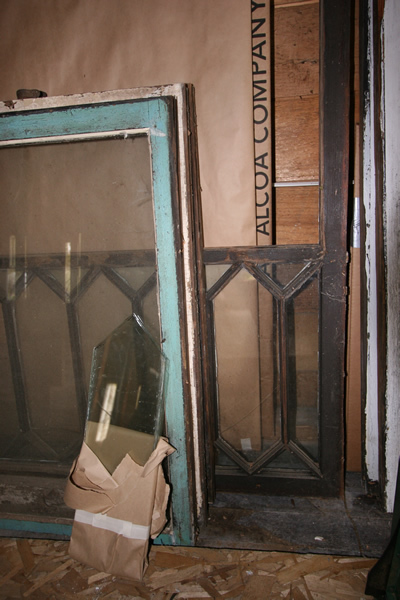 A fatal flaw in the original construction had led to extensive structural rot. The underside of the roof soffit going over the back porch roof had not been properly completed prior to the back porch roof being built, which then blocked access to that area. Raccoons and squirrels had gained access to the incomplete soffit and created damage that led to leaking and the eventual demise of the entire kitchen wall and half of the floor. 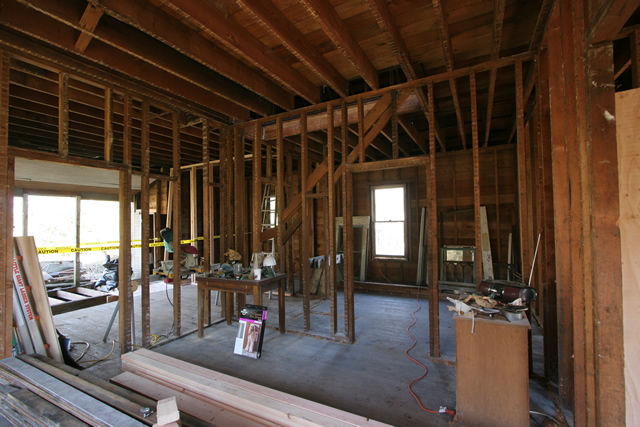 Looking into the kitchen, where the exterior wall and half the floor has been completely removed, shows another major problem. 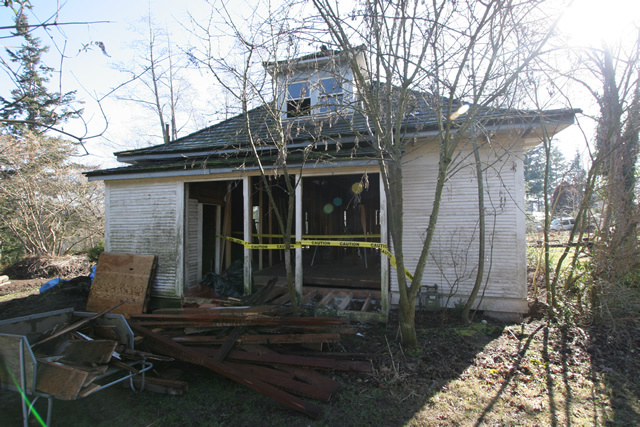 The crawlspace was lower than a nearby duck pond. A lake of water sat under the house. 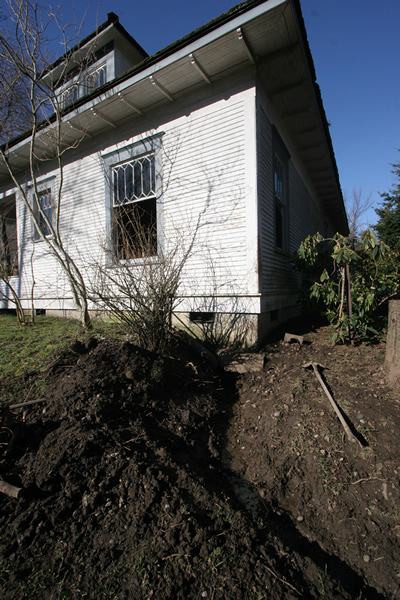 Here one can see at the bottom of the photo a portion of the trench the homeowners have been digging and the plastic saucer sled used to drag out loads of dirt. At the far corner of the house, on the downhill side, the ditch runs beneath the footing. The resulting stream flows constantly. Perforated drain tile and filter fabric were buried in the trench with drainrock. Then the entire crawlspace had a six-mil plastic vapor barrier laid down. The result was a clean and dry crawlspace in all seasons. The view from the dining room back through the house – the kitchen is back to the left, the library back to the right, and directly back in the far corner is the bathroom. The diagonal blocking in the wall in the center of the photo shows how the old stairway (now removed) came up from the kitchen. The new stairway will use the same general footprint as the old one, but will go in the opposite direction, starting here in the dining room. 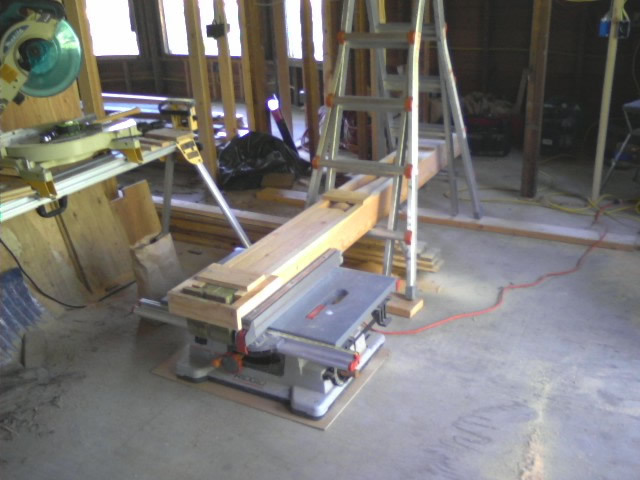 Stairway framing. 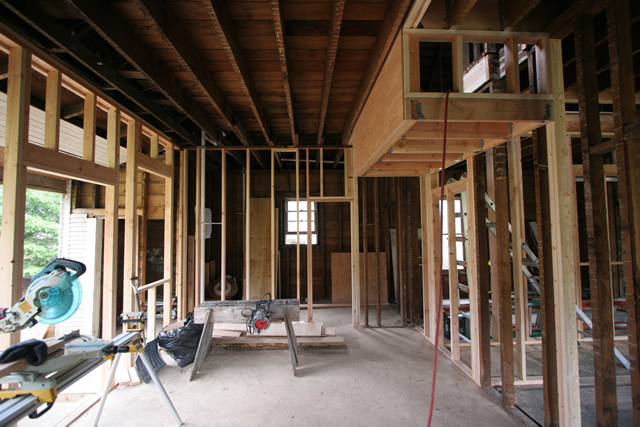 The hole allowing the stairway access to the second floor had to be expanded and significantly restructured to meet current codes. A pocket door going into the library was created at the foot of the stairs. 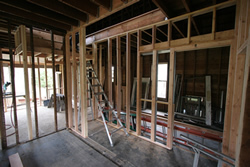 Kitchen framing. 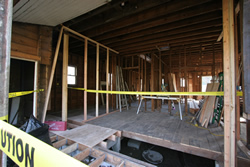 The exterior wall, to the left, has been completely rebuilt. The floor has been extensively repaired, including tying hold-down anchors down to concrete to pull down a significant hump, and installing a double layer of sheeting to make it stiff and flat enough for a stone floor. The stairway landing to the upper right protrudes down from the ceiling, providing a space under which major appliances can be sited. 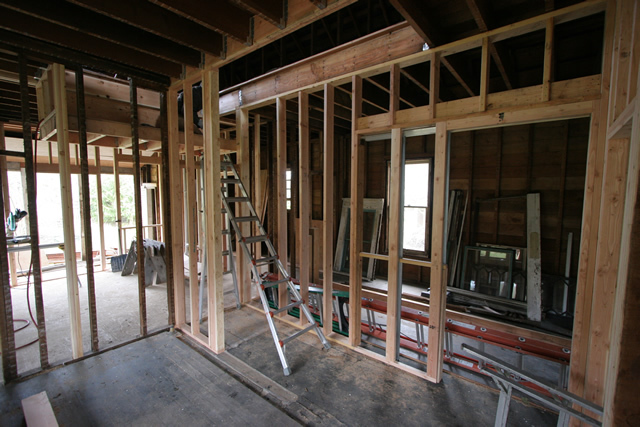 The landing is suspended from a new beam inserted into the ceiling framing, which is in turn supported by posts hidden within the walls going down to new concrete under the house. The new back porch. 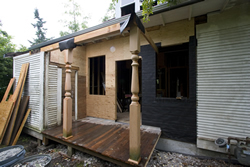 Custom millwork posts were used to rebuild the back porch. 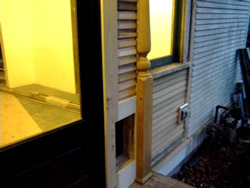 The small room off the porch has been retained as a mechanical and storage space. 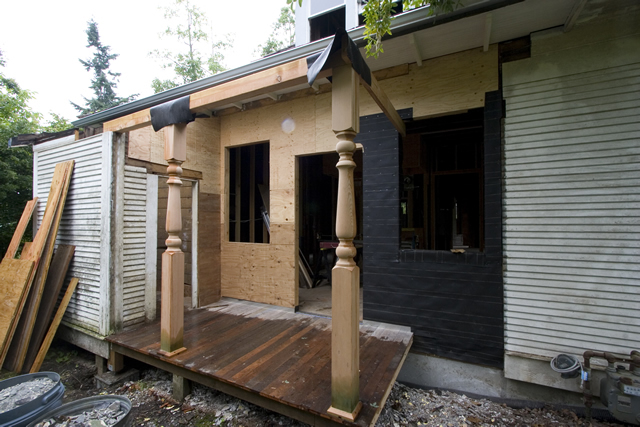 Fir flooring salvaged from the kitchen demolition is used here to create a traditional porch floor. 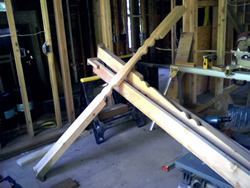 The back porch work required that one of the custom posts be split evenly to create two half posts. A jig was constructed to run through the table saw (the ladder is being used as an out-feed support). After one pass at half depth the post was removed from the jig and flipped for the second pass. End result – two perfect halves! One of the half posts installed. 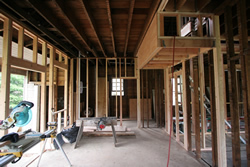 One of the pleasures of renovation is to learn from the past and not create the same mistakes. 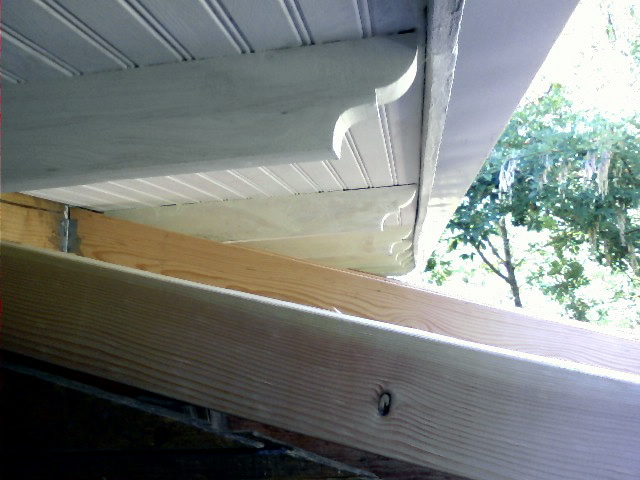 Here the underside of the problematic soffit area has been properly finished out (with new custom brackets to match the rest of the house) by reaching up through the open porch roof framing before the porch roof has been completed. 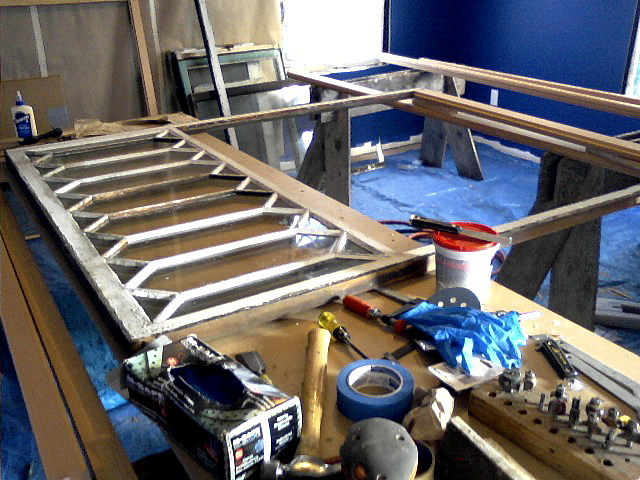 The painting has even been completed prior to the space becoming inaccessible.